15 March 2008 - all mares are overdue! Zaramilla and Wide Range (nearest camera) out in the paddock this morning. 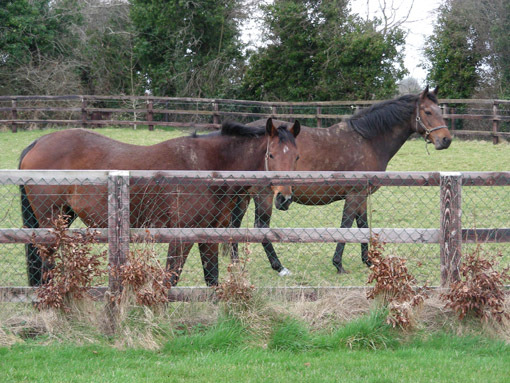 These are two of the four mares currently overdue. They range from one week to one month. So there is no time for sleeping and we are very much hoping for a foal over the weekend. The one we most want to foal is Zaramilla, pictured above, as she is a maiden and is now one month past her due date. Colt foal by Celtic Swing out of Sallie Lloyd's Oakwood Hills. He is now four days old and enjoying his time out in the small paddock. Lady of Kildare filly by Azamour enjoying a chat. Daffodils are reminding us that spring cannot be too far away!